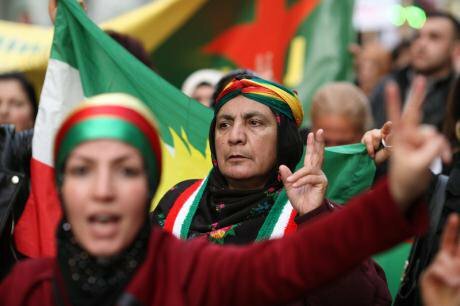 Thousands march in Berlin for the safety of Kobane, defended by the Kurdish YPG/YPJ, October 12,2014. Thorsten Strasas/Demotix. All rights reserved. While such tales have certainly increased the popularity of Kurdish female fighters in the international media - this was even featured in the free paper Metro - the reality is that these women and men who dared to stand up against IS put themselves in a very vulnerable position; they became the primary target of IS. Although they have been the strongest to fight back against IS, only the Peshmergas have been supplied with weapons and included in the US coalition to combat IS. The most visible change has perhaps been the inclusion of women in the defence force and the police as separate units through the establishment of the Women's Protection Units (YPJ) and the Women's Security Forces (HAJ). According to various estimates, female fighters make up between 7,000 and 10,000 of the Kurdish forces fighting in Syria, representing roughly one third of the People’s Protection Unit (YPG) in Rojava, the military force that has been set up to defend Rojava. Thus, the ideological support provided by the PKK and its leader Abdullah Öcalan has helped women within the Kurdish movemnet in North Kurdistan/Turkey to question and challenge women’s oppression and gender inequalities and many women began to develop a feminist consciousness. They strengthened their position within the legal Kurdish movement and built autonomous and semi-autonomous organisations including women’s assemblies within the pro-Kurdish political parties, women’s centres and associations, a press agency, women’s cooperatives, women’s academies and so on. Within the guerrilla movement, women also organised as separate and independent units by setting up their own party, the Kurdistan Woman's Liberation Party (PAJK) and their own guerrilla force (YJA-Star). For example in the 2007 national election the pro-Kurdish parties won 21 seats, with a female representation of 38 per cent. This was a significant achievement as the overall female representation in the parliament of the ruling Justice and Development Party (AKP) and the main opposition, the Republican's Peoples Party (CHP) was only 9 per cent. In the latest local elections in March 2014 in Turkey, only 37 women were elected as mayors (out of a total 1,364), of which over half were women from the pro-Kurdish parties who have applied the women’s quota rigorously. Besides the quota, the pro-Kurdish parties have been applying a pioneering power sharing system since 2009 that allows key decision-making positions within the party to be shared by both men and women. This means that all elected mayors and councillors have a co-chair who share their salary as well as duties and have equal rights of representing their constituency. Moreover, in the same memo, Turkish officials are reported to have suggested that a future Syrian constitution should be “Without mention of the Kurds and that any Kurdish problems should be resolved through local municipalities”. It is exactly this mentality of denial and the subsequent assimilation policies of the Turkish state – and similarly that of Iraq, Syria and Iran - that led to the uprisings of the Kurds in the region, causing the loss of over 40,000 lives in the conflict in Turkey alone.